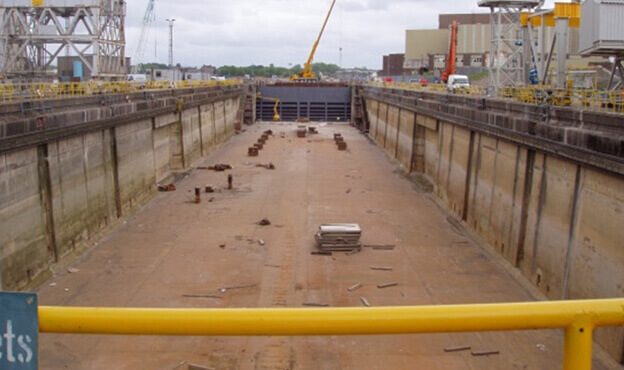 Spencer Group were responsible for carrying out the design, civil and structural engineering works at the BAE Systems Dry Dock. This involved remedial works to Scotstoun Dock, including the fabrication and installation of a new dock gate, marine piling, associated civil and marine engineering works, in addition to an operating and pulley systems. As part of this works, we were required to remove the existing gate and improve the quay, by replacing seal bolts and constructing the new dry dock with a hydraulic lock gates measuring 12m in height and 30m in length. Spencer Group also conducted all the associated building and civil engineering works, in support of the upgrade to docks 2 and 3 for BAE Systems. 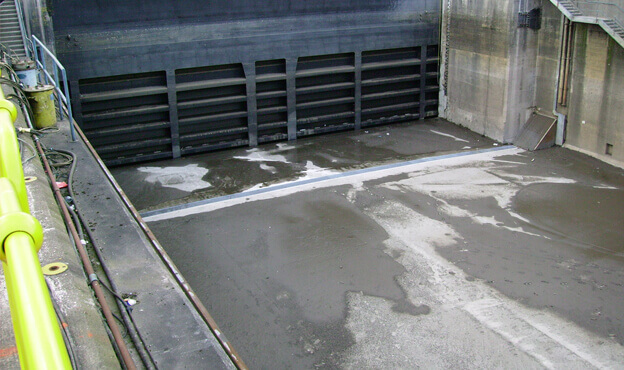 There were a variety of challenges faced during this project, the most prominent being converting the wet dock to a dry dock. 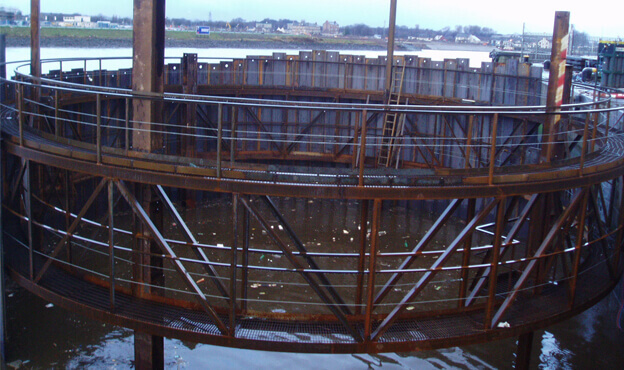 Five sheet piled, mass filed cofferdams were used to stem the water off, to enable fabrication, piling and dredging to be conducted within the dry dock area. The main challenge faced during this project was the discovery of an oil and chemical sludge layer during dredging works. A cofferdam was required in order to create a watertight enclosure around this layer. Through working alongside our local specialist supply chain, we were able to safely dispose of the oil and chemical layer without any harm to marine life. Spencer Group also collaborated with the Scottish Environment Protection Agency throughout the project to ensure correct environmental procedures were in place across site and no disruption was caused to Scottish Fisheries.